We featured the Caldecott Medal for a recent "K-2 Book Adventure Program." There are a bunch of Caldecott Medal and Honor books that work with puppets and act outs for this age group...the problem was, we had already done several of the best ones for this K-2 program over the past 20 months, including Anansi the Spider, Strega Nona, Fables, Raven, Officer Buckle and Gloria, Click, Clack Moo, Don't Let the Pigeon Drive the Bus, Knuffle Bunny, and The Lion and the Mouse. We started with the latest Medal winner, A Ball for Daisy (click for details), using a combination of acting out, scanned illustrations, and music. Tops and Bottoms by Janet Stevens is another excellent act out, with details on a previous post. 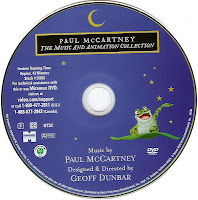 We finished by showing the video of Tuesday with music by Paul McCartney and a brief appearance by the voice of Dustin Hoffman, neither of whom mean anything to the 5-8 year olds, but maybe the parents appreciated it. The movie is pretty well done, though it ran a bit long for our program, so Brad edited out a few bits to get it down to 7 or 8 minutes. I was tempted, as I too often am, to try to cram in as much information as possible along with the stories, but reminded myself that this is mostly a story presentation and not a classroom, so I cancelled my plans for Caldecott trivia, scans from Randolph Caldecott's books, a "what the world was like 75 years ago when the Caldecotts staretd" feature, and snippets from Caldecott acceptance speeches (but if I was a teacher I'd do all of these). Instead we did "Name That Caldecott Book" as an interlude between each story. 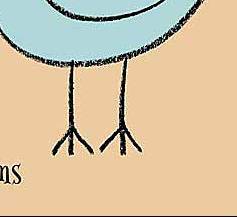 We scanned an illustration and uncovered it bit by bit, giving the kids a chance to guess. Lots of fun, and it also highlighted the distinct artistic styles. I was amazed that many kids guessed correctly after just the first slide for several of the books. We also wanted to show the range of Caldecott winners, so we made sure to include a couple of non-fiction titles, using these as interludes between the stories. We used scanned images and a mini-booktalk to highlight The Man Who Walked Between the Towers by Mordecai Gerstein. Later, we highlighted Me, Jane by Patrick McDonnel, again doing a quick booktalk and showing selected illustrations. Our program runs for 45 minutes, so we always need at least one good stretching activity somewhere around the 30 minute mark. David Shannon's No, David! was the perfect Caldecott choice. The kids mostly know this book, so we scanned several (not all) of the illustrations and just had the kids emulate whatever David is doing: Stretch for cookies; Swing a baseball bat; Run down the street ("but," I said, "please keep your clothes on"). We even showed the nose picking illustration, but it was immediately covered up by a big red circle/slash, which meant we were not supposed to do that one. We always have multiple copies of the books we feature available for checkout with this program, and most are usually taken. This time we added a table full of other Caldecott titles, and they went pretty well too. 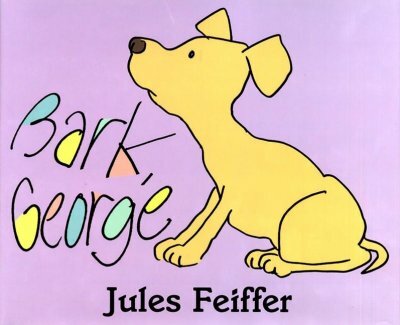 Bark George is a long-time librarian's storytime favorite. The illustrations are perfect and carry well for storytime, but it also tells great with puppets. The simplest way to tell it is the way I used for a class visit last week. You don't really need a mother...I just slide into the mother's role as I tell the story, pretty much word for word from the book. "George's mother said 'Bark, George!' And George went......'Meow'..." It's amazing how many kids think it's just hilarious to see a big dog puppet go 'meow.' As George continues to make the wrong animal sounds, you can play around with the timing. I usually hesitate a bit before "Quack!" Then blurt out the "Oink!" before the kids expect it. And do a long pause before the final "Mooooooo." I actually don't use a cow with puppets because I don't have a big enough one. So I used a big horse puppet most recently, and have also done it with a dinosaur. It's also fun to mix it up a bit because if it's a class visit there's a decent chance that the teacher has read it to them already. Then the story shifts to the Vet's office. It's fun to put on an actual latex glove as the Vet, and even switch it for an extra long one towards the end, but it's fine to do with no glove at all. After the Vet hears each of George's animal sounds (and I use the same pattern of hesitation the second time through), he reaches "deep down inside of George" and pulls out a Cat/Duck/Pig/Cow (or alterntate to Cow). The simplest way to manage this is to just have a puppet bag on your lap, acting as the Vet's examination table. Then lay George on his back on top of the bag, taking George off of your hand. The "reach" is just your hand going right behind George's mouth and into your bag, where you pull out the Pig and all the rest. It's not like a magic trick where you're trying to fool the kids or anything...they get what you're doing, but they're into the story and perfectly willing to suspend disbelief and respond as if you really did pull the pig out of the dog. 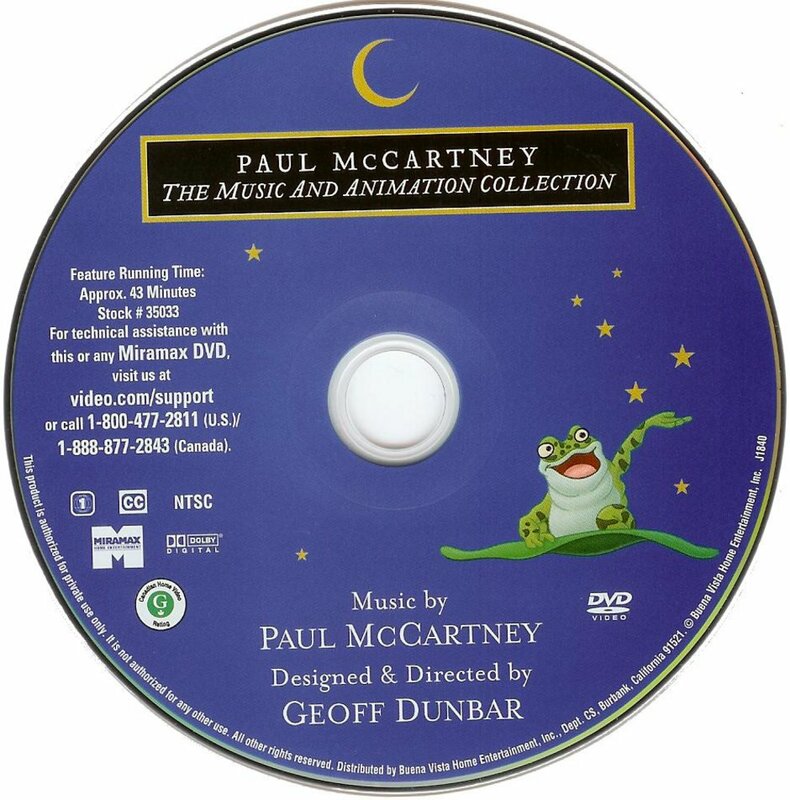 After George's stomach finally seems to be empty and he barks properly, his mother kisses everyone (which is me kissing the puppets and the kids thinking it's kind of disgusting), leading to the perfect ending, where George speaks one more time, only this time it's: "Hello." There are always some kids who don't quite get it, but there's also always several who do and at least one who will say, usually unprompted: "he ate a person!" And then the rest of the kids get it. 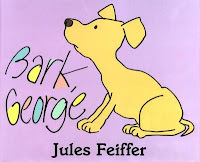 I only make one change to the book text: I drop the "Arf!" I just don't think kids know "arf" anymore. Ask 20 kids what a dog says and 13 will say "Woof!" and 7 will say "Ruff," but no one says "Arf" anymore. And the illustrations are so excellent that I even copy them for the puppet version. I never did it consciously, but at some point I realized I was trying to imitate the expressions and body language of George's mother each time he gets it wrong: clenching teeth, flopping head....now that's a good illustrator. This is also a fun two person story...I used to co-tell it with Ginny Watt at the Beaverton Library. She would be George's mother, with another dog puppet, and you can get some good interplay between the two characters. Then Ginny would put on that glove and be the Vet for the second half of the story. And we were a little more elaborate with the puppets, hiding them behind the bench we sat on, rather than having them right there on our laps. And though I haven't tried it myself yet, it would definitely make an excellent puppet show with a stage, where you could make the pulling-animals-out part even more visually effective. Since we often do team storytelling at our Library, I get to try stories that others have been doing for a while, but are new to me. I knew the story of Martina the Beautiful Cockroach, but had never actually read or performed it for kids. It's a favorite of Sheila's, though, and she suggested we do an act-out version for an outdoor performance at our local Wilsonville Arts Festival. 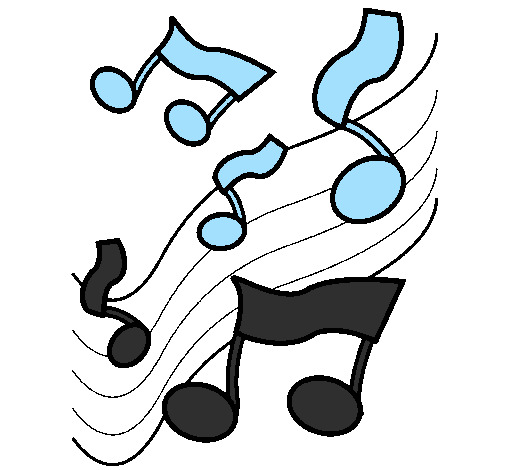 There's singing involved, which is not my favorite thing, but it's supposed to be bad singing and that I can do. 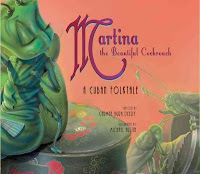 The version we did, developed by Sheila and Terri over the years, features Sheila as the beautiful bug. She wears some antennae and some frilly stuff and voila: a cockroach. In the Deedy book version, Martina tests each of her suitors by spilling coffee on them and watching their response. We adapted this, going with a more direct approach for younger audiences: She asks each suitor to sing, and when they sing badly, she rejects them. So I enter as Senor Perro, with dog ears of some sort, and of course am instantly smitten by her cockroachian beauty. 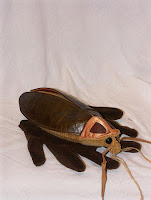 (I'm never sure if kids get the absurdity of a cockroach being so popular with all the guys, but I sure think it's funny). When she asks me to sing ,I do a badly out of tune version of "Twinkle Twinkle," substituting "woofs" for all the words. That's simple enough for the kids to catch on quickly and join in. When Martina expresses her displeasure, I leave sadly, then reappear as Senor Gato, then Senor Rana. Same tune, different words ("meow" and "croak"), same result. Then Senor Raton appears and shows us all how to win the heart of a cockroach. He sings "La Cucaracha," in a not-so-bad voice (okay, it's still pretty bad, but it's as good as I can do and it's way better than those other animals at least), and Senorita Martina accepts his marriage proposal. It's a fun and simple story, and quite easy to learn. We actually did this one with no rehearsal because we've been so busy with other stuff (a little thing called "Summer Reading Program"), so the simplicity of the story was just right. But within that simple structure there's lots for room for playfulness and silliness as the characters interact. Giving a guitar to the male suitors is a nice touch which Terri and Sheila use when they do the story, but it seems to work fine without that as well (because that's another skill I lack).